Since I last wrote this column, NSDN has been to three races to round out the 2010 sand drag racing season. It all started off with our first trip to Kentucky’s Little Sandy Raceway for Show Me The Money 2010. This race ended up being one of the most entertaining races of the season. There was excellent racing with the big money on the line, and a great camaraderie at the track cultivating a great time for all who attended. I’m definitely looking forward to making the trip back to Grayson in 2011. The next big event on the west coast looks to be the 2011 AZ vs. CA Top Fuel Shootout at Dome Valley Raceway in Wellton, AZ on January 22-23. A race flyer & pre-registration form has been released with all of the details from this event. A download link to the Pre-Reigstration Form (PDF) is below, and click “Read More” to view the event flyer. 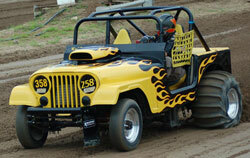 The Las Vegas Jeep Club has announced their 2011 date for the Jamboree at the Dumont Dunes in CA. This will take place during the traditional President’s Day Weekend time frame being Feb 18-20 in 2011. This event features sand drags and a unique hill climb event. Click “Read More” to view the event flyer. Atoka Motorsports Park in Atoka, OK held their final race of the 2010 season on November 13. A rain storm canceled Test and Tune on Friday night, but Cecil Wilson once again did a great job prepping the track for a great day of racing on Saturday. The Texas contingent showed up and put on a great show. The Pro 1 Cars class lead the pack having 14 entries. Read on for full race results. 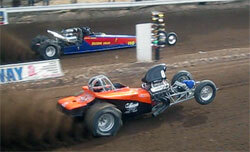 Sunday saw the conclusion of the 2010 West Coast Winternational Sand Drags in Kingman, AZ. Dennis Rieck took home the victory in the Top Fuel class with a 2.49 final round winning time. The Top Alcohol class was dominated by Gary Mink, who ran Low ET of the entire event with a 2.43 in round two eliminations. Billy Morris topped an extremely tough Top Eliminator field to complete an undefeated season. Brian Chapman and the Short Fuse team emerged victorious in the A/Fuel class running a 2.89 to defeat Art Cronin in the final round. Read on from more results from this event. Little Sandy Raceway in Grayson, KY played host to the Show Me The Money race for the first time in 2010. Rich Simon, of the Pro Truck Nationals series, and Steele/Wilson Racing’s Ryan Wilson joined forces with Little Sandy Raceway’s Jim Johnson to put on a great season ending event for the Midwest racers, and they did just that with SMTM 2010. With big payouts on the line as well as great track conditions, this was one of the best races of the season. Let’s take a look at the action. Dome Valley Raceway in Wellton, AZ held the October Showdown in late October with help from Swag Racing and the AZ Top Fuel Group. Absolutely chamber of commerce weather greeted racers and crew as they readied for a weekend of great racing on at Dome Valley Raceway. Once again, Ernesto Juarez had the surface prepped to perfection and that led to some great on track racing action.